(1989) On a wintry Greenwich Village street (6th Avenue, between 3rd and 4th - steps away from Film Forum), street portrait artist Charles Lane (the writer/director himself) battles a bullying, giant fellow artist, strokes attractive businesswoman Sandye Wilson’s cheek a little more than needed to get those proportions right, then gets stuck with adorable tot Nicole Alysia (Lane’s real-life daughter) when her gambler dad gets knifed – all in b&w silence… without a single intertitle. An homage to Chaplin’s The Kid (and other movies) set in a then-tough Village. 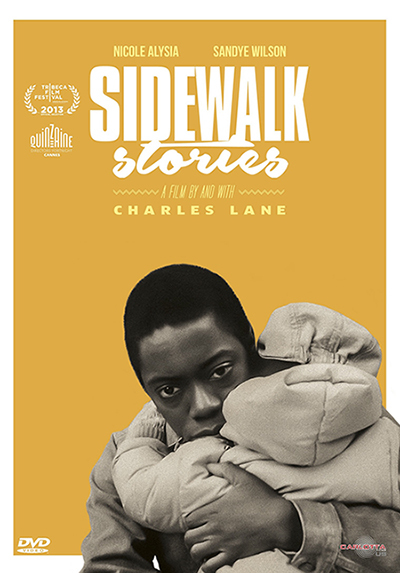 Clearly capturing the plight of the homeless, Sidewalk Stories retains a magical sense of the fable. "WEAVES A SPELL AS POWERFUL AS IT IS ENTERTAINING!" "AS EMBLEMATIC A NEW YORK FILM AS THERE IS!" "A GREAT, LOVABLE, MONUMENTAL FILM THAT'LL FINALLY GET ITS DUE! You might never have heard of it, but thanks to this rediscovery, restoration and re-release, that'll never be the case again." "SHOULD BE INCLUDED IN THE GOTHAM CANON! A much gentler, smaller, but no less impassioned portrait of New York and its woes at the tail end of the Koch administration than ‪Spike Lee’s studio-backed Do the Right Thing." Special price: $18 plus tax and handling. Merchandise will be delivered within 2 weeks of order.